Round Braided Natural (Undyed) Leather Cord Necklace 4 mm. 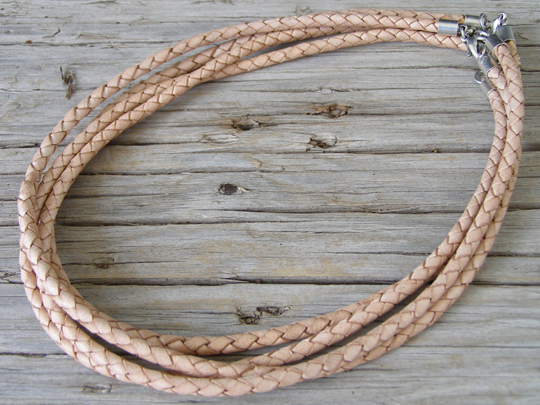 16"
This is a round, braided natural (undyed) leather cord choker. It is 4 mm. diameter and 16 inches long. It has silver-plated end caps and the closure is a silver-plated lobster clip. This works quite well with some of our pendants which have smaller bales. This item is not made by Native Americans. Diameter of braided leather cord: 4 mm.